2. Inscription: "Belonging to Azariah son of Hilkiah"
3. Provenance: City of David archeological dig, 1982 AD. 7. Events: Nebuchadnezzar's 1st attack on Jerusalem during the reign of Jehoiakim, the Bible burning king. 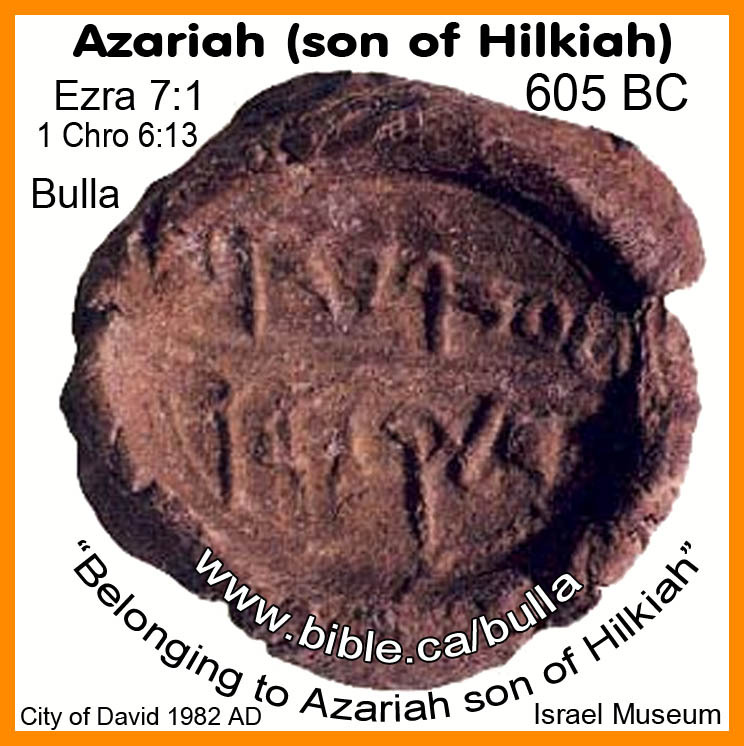 Bulla "belonging to Azariah son of Hilkiah"
1. It is 605 BC in the 5th year of Jehoiakim king of Judah. a. Jeremiah is directed by God to write a scroll to warn Judah that Jerusalem will be destroyed unless they repent of their idolatry. b. Jeremiah's scribe, Baruch the son of Neriah (click to see Bulla of Baruch) is given the task of reading the inspired message of doom. c. King Jehoiakim burns Jeremiah's scroll in December in the fireplace of his winter palace. d. See outline: Jehoiakim, the Bible burning king. 2. 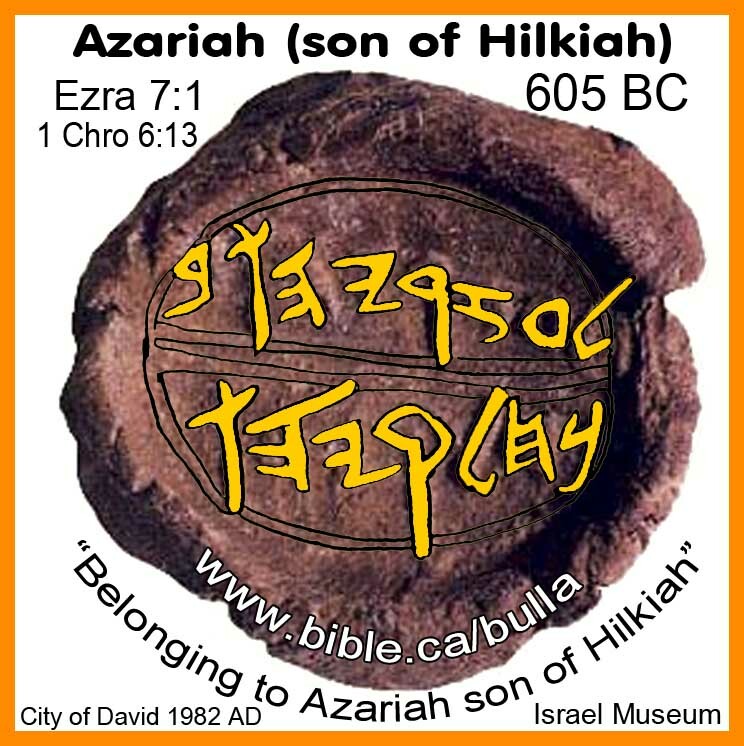 BULLA OF AZARIAH, SON OF HILKIAH: The bulla of "Azariah son of Hilkiah" is one of the most important discoveries in the history of Biblical archeology since he is the son of High priest Hilkiah who found the book of the Law (Torah) in the temple at the time of Josiah (623 BC). He was also high priest after his father died. 3. There is no information about Azariah, except he is the son of Hilkiah. He is not mentioned in any specific story in the Bible but is listed in genealogies (Ezra 7:1; 1 Chron 6:13). 4. The stunning discovery of this bulla came from an official archeological dig in the city of David in 1982 AD so there is no question about its authenticity. 5. 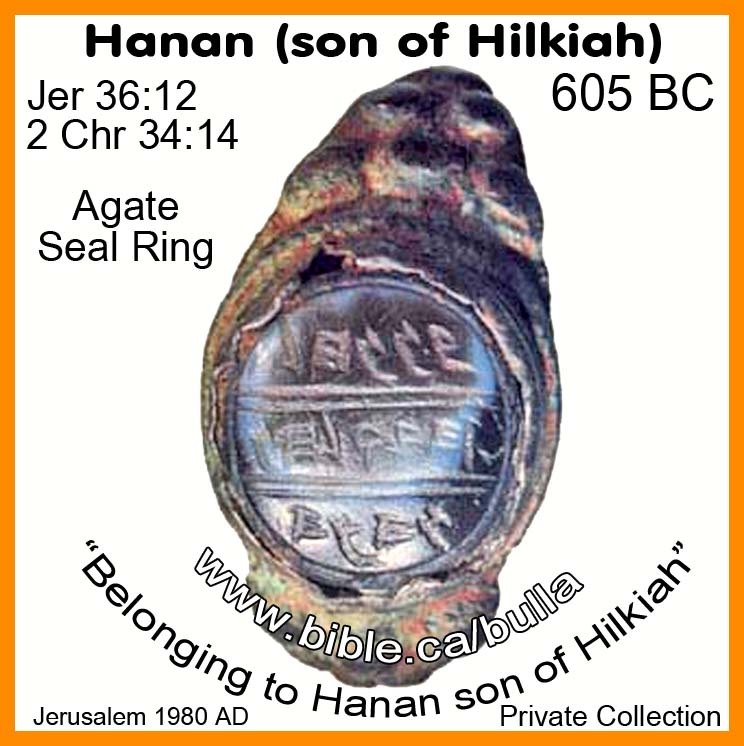 Archeology has verified two sons of Hilkiah: The Bulla of Azariah and the Seal of Hanan. 6. Which Hilkiah was it? a. While it is possible that Azariah and Hanan were brothers to Jeremiah and sons of Hilkiah the high priest, it is highly unlikely. 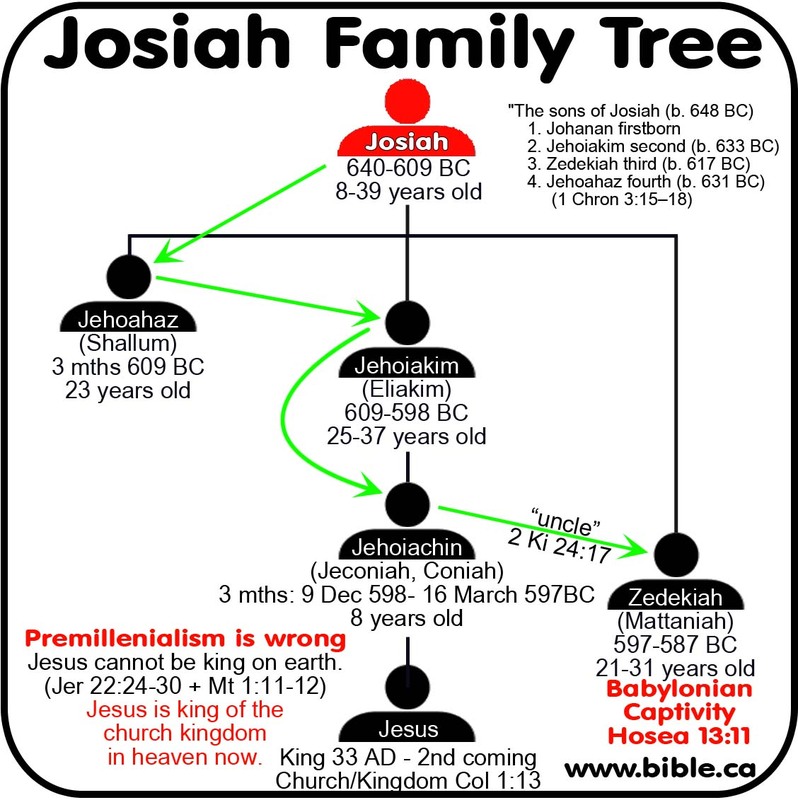 c. Jeremiah cannot be the son of Hilkiah THE HIGH PRIEST because the descendants of Eli were banished by David and dismissed forever from being high priest. 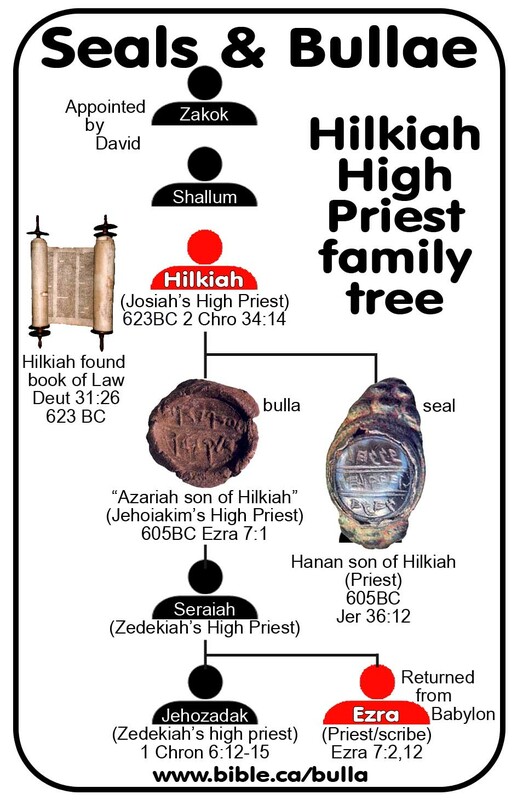 This answers the question definitively that Jeremiah's father, Hilkiah, was not the same as the Hilkiah the high priest who would find the book of the law in the temple. d. Since Jeremiah was part of the "defrocked" clan of high priests, they likely had little official business connected with the temple. This would make it unlikely that Azariah, the son of Hilkiah, brother to Jeremiah would have a bulla. e. Azariah and Hanan were brothers and sons to Hilkiah the high priest while Jeremiah was unrelated, being the son of a different priest named Hilkiah from Anathath. 1. 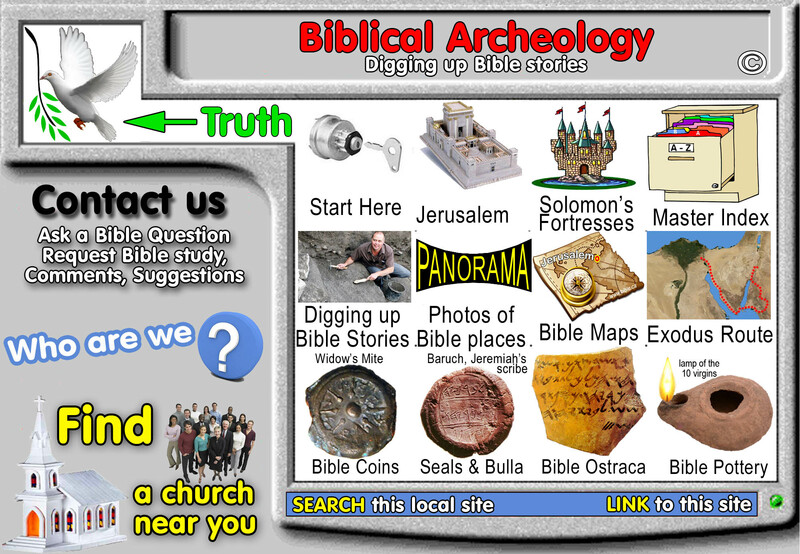 The bulla of Azariah came from an official archeological dig in the City of David in 1982 AD. b. Hanan, Hananiah is a very common name found in the Bible during the entire time from David down to the time of Nehemiah. This Hanan, however, is specifically unknown to scripture as the son of Hilkiah the high priest. The seal is actually part of a ring, which is typical. This incredible artifact surfaced in the antiquities market in Jerusalem in 1980 AD via an antiquities dealer and is therefore unprovenanced. Since it was NOT excavated as part of an official archeological dig, there is always the chance it is a fake. However, there are many genuine seals and bullae that surface this way and there is no reason to question its authenticity. 3. The same person created both the seals of Azariah and Hanan. a. 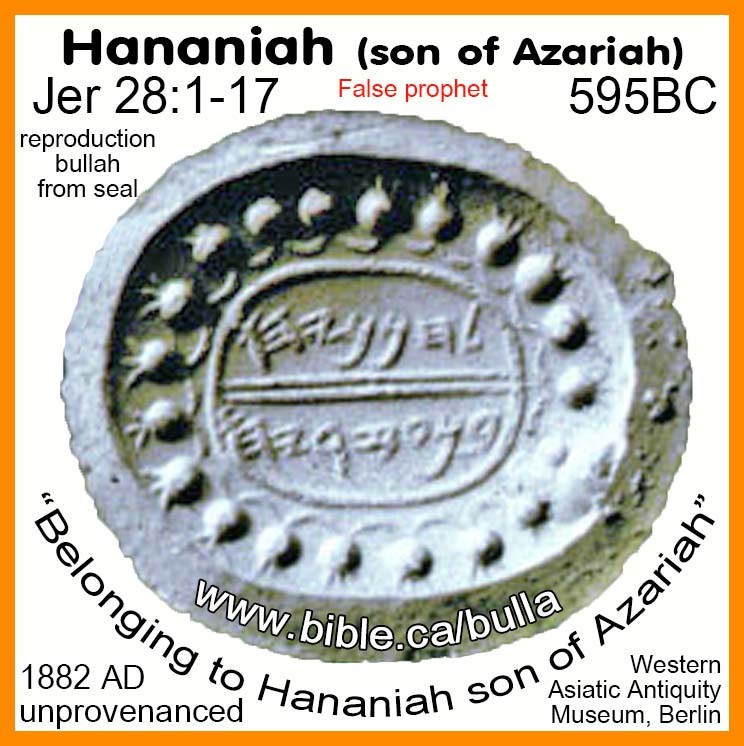 This is important because since we know the Azariah bulla came from a provenanced legal, controlled dig in the City of David, it helps to validate the seal of Hanan. 2. The best possible choice for Hanan son of Hikiah, is found in Jer 36:12 dated to 605 BC. 1. The bulla of Azariah son of Hilkiah the high priest dates to 605 BC and is a spectacular archeological find that references two High Priests just before the Babylonian captivity of 587 BC. 2. The seal of Hanan (Hannaniah) son of Hilkiah is judged to be genuine as well. a. Although there are no direct Bible verses, the best choice is Jer 36:12 which dates to 605 BC. 3. The Bulla of Azariah is 100% provenanced because it came from the City of David dig in 1982 AD whereas the seal of Hanan is unprovenanced through the antiquities market but judged to be genuine because it shares the same script style as the seal which made the bulla of Azariah. 4. 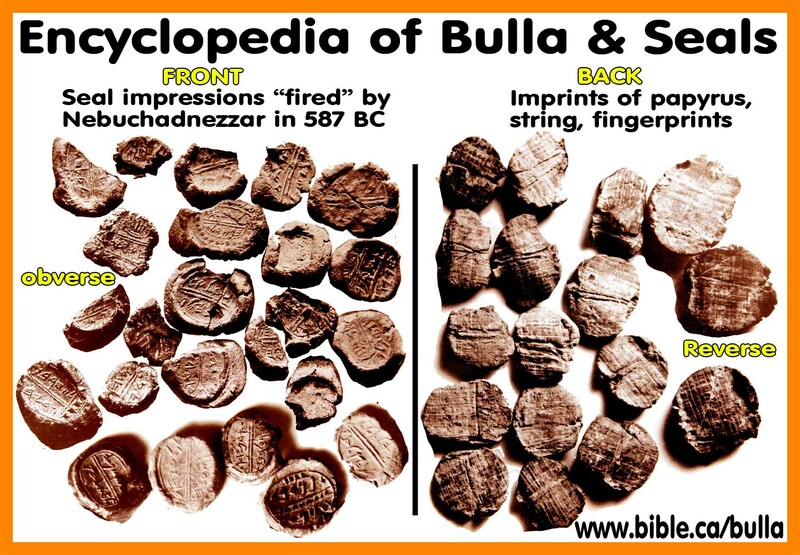 Both bulla of Azariah and the seal of Hanan date to 605 BC which was the year Nebuchadnezzar first attacked Jerusalem during the reign of Jehoiakim, the Bible burning king.